Step into your truck with class by getting a set of APS 4" Brushed Aluminum IBoards. They are offered in a hairline brushed polished finish, so you can be sure to get the style that meets your needs best. IBoard's are constructed of 6061 aircraft aluminum. This high grade aluminum is resistant to rust and corrosion. 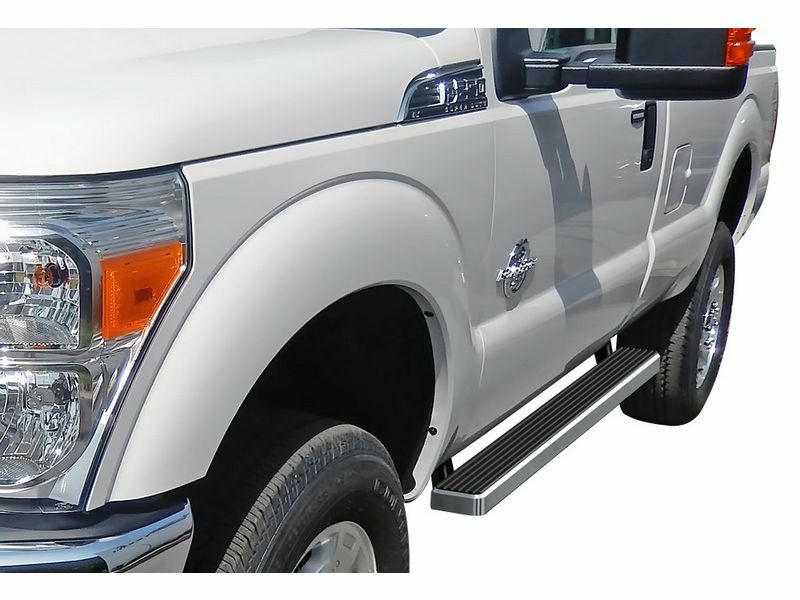 These running boards offer 4 holes on each mounting location providing one of the strongest structures in today's market. They offer a unique, but functional appearance. They are also easy to clean. Simply take the water hose, spray them off and wallah, they look brand new again. APS 4" Brushed Aluminum IBoards are an easy installation and will come with simple DIY instructions. Normally they take under an hour to install. IBoards are designed after the iPhone resulting in a flat, low profile design that will captivate the eyes of everyone. Get to steppin' and get your APS IBoards today! APS 4” IBoards come backed by a one year warranty covering all defects in materials and workmanship. Installing the APS 4" Brushed Aluminum IBoards is an easy, do it yourself installation. Set aside about an hour of your time and BAM! You will have yourself a functional step up into your ride. Most applications require no-drilling, but installation instructions will be provided.